Reverend Dr. R. Arulappa, former archbishop of the Madras diocese, who claims to have been duped by one Acharya Paul, also known as Ganesh Iyer, is ill. Incapacitated by serious cardiac problems. In fact, it is his ill-health that forced him to retire from his post as head of the diocese. So the infamous scandal had to be pieced together from court records, police files and the ramblings of the main character – Ganesh Iyer. Arulappa was a Tamil scholar who also had the reputation of being a researcher. He had translated the New Testament into Tamil and set to tune the Book of Psalms. He had also rendered in Tamil the life of Christ, Ulagin Uyir (“The Life of the World”). He had learned Sanskrit and translated several Christian tenets into that language. He had also done extensive research on Tirukkural, the creation of the Tamil bard, Tiruvalluvar. Tiruvalluvar is known to modern generations through his immortal literature. The exact time of his existence is lost in the mists of the hoary past. Some historians believe Tiruvalluvar to be a product of the early Sangam period in Tamil literature, several centuries before Christ. The Tamil Nadu government bases its calendar on the year of his birth. For this purpose, it is assumed that Tiruvalluvar was born exactly 2018 years ago [this article was written in 1987], i.e. in the first century before Christ. Some literary experts place Tiruvalluvar in the first century after Christ, others date him 300 years after. Just as little is known about Tiruvalluvar’s origins, his religious beliefs are also shrouded in some mystery. Attempts have been made, going by the precepts contained in his verse, to speculate about his religion. While he is widely believed to have been a Hindu and the Tirukkural considered a revered Hindu scripture, other religions too have staked a claim on him. Since the Tirukkural enshrines the ideals of ahimsa, dharma and asceticism, many experts consider Tiruvalluvar to have been considerably influenced by Jain thought. Since this suited the archbishop’s scheme and since Arulappa was convinced that Ganesh was in a position to ferret out the evidence necessary to prove his pet theory, he engaged him to take up the research. The archbishop was apparently lulled into complacency by Ganesh’s mastery of Christian theology and his apparent sincerity of purpose. 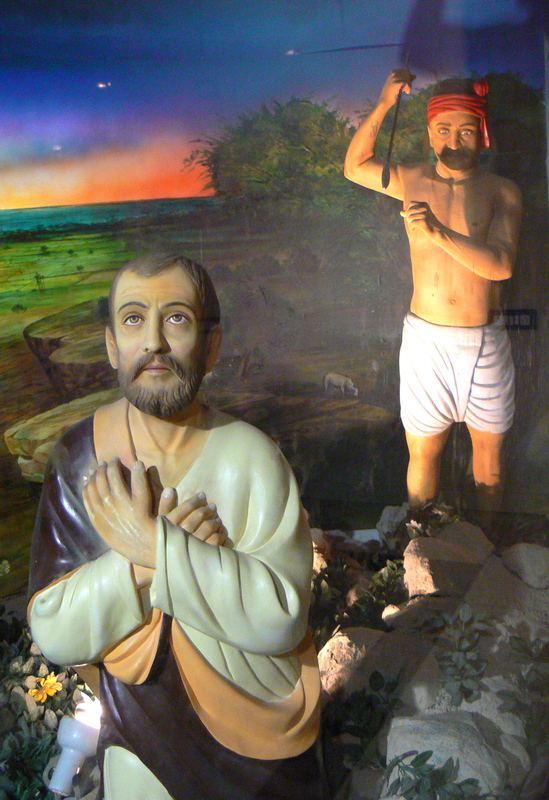 As if establishing a nexus between St. Thomas and Tiruvalluvar were not enough, John Ganesh also informed the archbishop that he could bring evidence that the three wise men from the East who prophesied the birth of Christ were none other than the epic Hindu sages, Vasistha, Viswamithra and Agasthya. Using the funds provided by the archbishop, Ganesh Iyer made a pretense of travelling extensively. It was a well-orchestrated programme. He would first inform the archbishop that he was going to Kashmir in connection with his research. Whatever doubts the archbishop may have entertained about his researcher vanished in the face of these letters from eminent personages. More money changed hands. Though he was quite poor when he first met the archbishop, by the time he was through, Iyer had his own house in Srirangam. He owned two cars. He had purchased considerable gold jewelery for his wife and daughters. He had substantial deposits in banks in his name. Most of the funds for the research had come from individuals and organisations abroad. If Iyer is to be believed, the archbishop even made out his personal car in Iyer’s name for a nominal Rs. 25,000. Iyer himself claims that he had not paid anything. Questions were being asked around this time about the large sums of money being given to Acharya Paul for his research. The sceptics demanded proof that something tangible, that would benefit Christianity in the long run, had indeed been achieved. Only the archbishop’s pre-eminence prevented a direct confrontation. In 1976, Iyer obtained a passport in the name of Acharya Paul. In 1977, accompanied by the archbishop, he went abroad. To the Vatican, among other places, where he had a lengthy audience with Pope Paul VI. The duo then visited several religious congregations and spoke about comparative religions. Everywhere he went, he spoke about the origins of Christianity in India and about his “monumental” research while the archbishop displayed the evidence. Money was collected for funding further research. Investigations into the sordid episode began. The police, led initially by Inspector Seshadri and later by Inspector Chandrayaperumal, searched Iyer’s residence. They unearthed the originals of all the photographs produced by Iyer as proof of his research-writings on strips of brown paper cut to resemble medieval palm frond writings, pasted on sheets of white paper. The police learnt that the photographs had been taken at a studio in Tiruchi and this led to the seizure of all the relevant negatives. The police discovered how the photographs had been authenticated by various institutions-seals and rubber stamps of all the concerned institutions were lying in Iyer’s home. Letter-heads bearing the names of various Hindu and Christian scholars were recovered. The letters purported to have been received by Iyer from these personages, which he allegedly used to dupe Mariadas and later the archbishop, were declared to be clever forgeries by the state handwriting expert Srinivasan. The writing on these and the writing on the brown paper, though cleverly disguised, compared favourably with Iyer’s specimen. Account books showing details of amounts received from the archbishop and the amounts spent by him were recovered. Iyer’s antecendents were thoroughly investigated and it was proved that he was a middle school dropout, not having studied beyond standard seven. Further confirmation was obtained from the Banares university that they did not have Dr. John Ganesh on their staff either teaching or doing research into philosophy and comparative religions. The magistrate’s judgment notwithstanding, doubts still linger. Why were the archbishop’s suspicions not aroused until he had handed over a whopping Rs. 13,49,250 (according to records, though Iyer claims to have received far in excess of that sum) on a spurious research project? Why had the archbishop not bothered to verify the authenticity of the “documents” produced by Iyer with the museums and other institutions concerned, directly? Why did he not bother to accompany Iyer to the actual site of his “research” when he had found time to accompany him to Rome, the Vatican, Germany, France, Spain, the United States? What is even more curious is that even as criminal proceedings against Iyer were in progress in the magistrate’s court, a civil suit for a compromise had been filed in the Madras high court. The compromise decree was taken up immediately after the conclusion of the criminal case. Since Iyer had admitted the offense, his jail term was reduced to a mere two months imprisonment. And since he had already served 59 days of remand, this period was adjusted against the sentence. In other words, Iyer, who had defrauded the archbishop to the tune of about Rs. 14 lakhs, was let off without any further punishment. He was ordered to forfeit all claim on the money given to him by the archbishop. Accordingly, the ornaments and money seized from him by the police were returned to the archbishop. As part of the compromise, Iyer was allowed to retain the large bungalow he had purchased with the archbishop’s money. “I agreed to this compromise because there was nothing else I could do,” says Iyer. His viewpoint in understandable. For, going by the lower court’s verdict, he would have not only had to serve 5 months of rigorous imprisonment, but would have automatically had to forfeit all his properties including the house. Why the archbishop agreed to the compromise is not understandable. Today Ganesh Iyer lives on the first floor of his house in Srirangam—the lower portion is let out on rent, enabling him to receive a monthly income. He is by no means affluent, but is certainly a far cry from the penury to which his family and he would have been consigned, if it were not for the compromise. Father Arulappa is convalescing, recovering from a major surgery. He has handed over the mantle of archbishop to Reverend G. Casimir on health grounds . This entry was posted in christianity, history writing, indian history, madras, madras-mylapore archdiocese, media, mylapore, religion, st. thomas and tagged acharya paul, apostle thomas, arulappa, chennai, christianity, ganesh iyer, madras-mylapore archdiocese, mylapore, religious history, saint thomas, thiruvalluvar, tirukkural. Bookmark the permalink.